Superhero Sayings: Everybody in the future a prick? 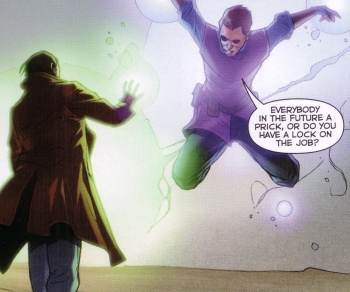 While battling a villain from the future the good Doctor chucks this insult out before attacking him. This is a mature graphic novel with some great plot twists and excellent dialogue! If you're a fan of the Authority or edgier super-heroics then definitely look this one up! While I doubt any of us would be able to use this insult it should come in pretty handy if you met someone from the future or delusional enough to believe that they are! References: Taken from The Authority: Human on the Inside (ISBN: 1-4012-0070-2) by John Ridley (author) and Ben Oliver (artist).